A regional journalist who spent half a century in the industry and was also a successful football manager has died aged 86. Tributes have been paid to Alex Main, who worked for titles including Aberdeen daily the Press & Journal and The Scotsman during his 50-year career. A former winner of the Barron Trophy, which recognises lifetime achievement in Highlands journalism, he was also awarded life membership of the National Union of Journalists. Away from journalism, Alex also managed former Highland League football club Inverness Caledonian, for whom he had previously played, during the 1970s and 1980s – winning 14 trophies, including four league titles. Gordon Fyfe, chairman of the Highlands and Islands Media Awards judging panel, knew Alex as a fellow journalist, golf partner and as a footballer who played under him at Caledonian for 10 years. He told the Press & Journal: “Alex was focused on being the best at everything he did, from his journalism to his golf and his football. His 50 years of service to journalism in the Highlands and Islands is without equal. His fairness, accuracy, impressive network of contacts and nose for a story singled him out as a top reporter. “His success as a football manager was entirely down to his good judgement of players, creating a great team spirit on and off the pitch and his fairness and loyalty to his players. Alex began his career in journalism in 1947 with the Inverness Courier and went on to work for the Highland News, Football Times, Press & Journal, Daily Mail, Daily Express, The Scotsman and finally back to the Inverness Courier. He retired on 25 April 1997. John Ross, chairman of the Highlands and Islands Press Ball and former Highlands and Islands correspondent with The Scotsman, said: “Alex was one of the finest journalists in an era of fierce competitiveness in the newspaper industry. He was hugely respected by his colleagues, but also those he wrote about. 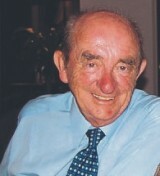 Such was his contribution to journalism in the Highlands and Islands, he was made an honorary member of the Press Ball. Under Alex, Caledonian won the Highland League in 1976-77, 77-78 and again in 1981-82, 1982-83. The club also won the Rothman’s Football Yearbook non-league team of the year in 1981-82. Former Caledonian captain Peter Corbett said: “His record of success was unbelievable. He was old school – a real gent. His approach was simple. He knew a good player, he was organised, he was firm but always fair and he allowed the players to express themselves on the park. Caledonian merged with Inverness Thistle in 1994 to become Inverness Caledonian Thistle and are now an established Scottish Football League side. Married to Ella, Alex had two sons, Alan and Richard, and two grandchildren, Nicolas and Leah.